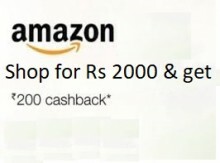 Amazon India offering Prime cashback offer. In this offer Shop worth Rs 2000 from any of the following categories: Baby, Beauty, Grocery and Gourmet products, Household, Health and Personal Care, Luxury Beauty, Amazon Pantry Personal Care Appliances, Pet Supplies and Toys and get flat Rs 200 cashback.. Check Here offer terms & conditions .You can follow the below steps to buy this product at their deal price.Keep Visiting dealsheaven.in for more Best offers ,hot online deals, promo code, coupons and discount . c. Offer is valid on payment with any prepaid method.